Finally! A Complete Back Yard Training Blueprint For Building An All-Star Hitter! Discover 14 Simple Hitting Drills You Can Use In Your Back Yard, Basement, or Garage, to Develop a Faster, Smoother and More Powerful Swing! 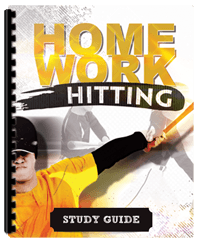 Introducing the Homework Hitting Online Video Clinic. It's packed with 14 fun and effective hitting drills specifically designed for at-home use. It's perfect for parents, coaches, or players looking to build their hitting skills, improve their mechanics, and become an unstoppable force at the plate! The P90-X of Hitting Workouts? At-home exercise programs like P90-X revolutionized the fitness industry by giving people a "personal trainer quality" workout in the comfort of their own home. And now, the Homework Hitting online video clinic is about to do the same for baseball players. 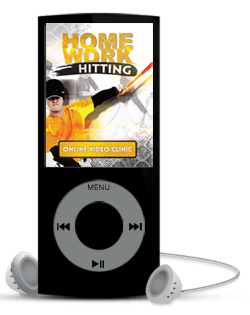 Make better contact, get more base-hits and RBI's, and score more runs for your team! Best of all, the drills can be done at team batting practice OR at home... in the garage... on the driveway... in the back yard or -- with some drills -- even inside the house! Your instructor is the legendary Utah High School Coach Steve Cramblitt... one of the most innovative hitting coaches on the planet. Cramblitt is a former ABCA National High School Coach of the Year... 10-time Utah State Champion... and maybe the country's number one authority on hitting mechanics for youth and high school players. An easy soft toss drill that helps players develop a smoother swing... and sends their batting averages soaring! How to use whiffle golf balls and a broomstick to improve players’ perception and vision. So they make better decisions at the plate, and more solid contact! How hitters can use one hand at a time to isolate and perfect specific hitting mechanics and movements! A simple tee drill that seriously improves a player’s ability to hit both inside and outside pitches! A groundbreaking drill that allows players to actually FEEL how their body should move during a swing... so it becomes like second-nature to them! How to perfect the stance and improve balance for better hitting results! How to best reach players who are visual, oral or tactile learners – you’ll be surprised at how easy this is to do and how much more effective your coaching is when you use these simple tips! In All, You're Getting 14 Top-Notch Drills That Will Help ANY Player, No Matter Their Skill Level, Improve as a Hitter! Plus, dozens of specific pointers from one of the best high school coaches of our era -- a highly respected hitting expert who guided 10 high school teams to a state championship. Here's what really makes this a "must-have" resource for this baseball season. If You Order Today, We'll Also Throw In 3 Additional Bonus Gifts Valued At $52.85! These bonus gifts are easily worth $52.85, but they're yours FREE when you order today! Click the Add to Cart button below to get started right now! You have nothing to lose! Claim Your Copy of Homework Hitting Right Now! Yes, I want the Homework Hitting Online Video Clinic, plus the bonus MP3 Audio Seminar, the Coaches Study Guide, and the Workout Plans. Give me instant access to this step by step training blueprint right now! What age level are these drills designed for? We recommend this program for ALL ages and competitive levels. Here's why... The drills are all designed to develop and refine your hitter's mechanics, including swing sequence, bat speed, power, rhythm, and timing. For younger players, you can use these workouts to teach the basic fundamentals. For older players, these drills are ideal for correcting bad habits or common mistakes, and helping them refine and perfect their swing. I'm new to baseball, will this be over my head? No! The drills are all explained in simple, step by step detail, with detailed demonstrations and tips from Coach Cramblitt to guide you every step of the way. And we're also including minute by minute workout plans, so you'll know exactly what drills to use, when to use them, and how long to use them for. I already understand hitting mechanics. Will there be anything new here for me? Absolutely. Coach Cramblitt is famous for his innovative approach to developing hitting skills. I guarantee you'll find several fun, new drills you've never used before. Plus, lots of coaching tips and ideas to help you communicate these concepts in a simple way that players really "get." How many hours or minutes per week do these workouts require? Each workout can be done in around 15 minutes. Just one workout per week will produce results that you will notice in just a few weeks. If you want to accelerate your results, work out 2-3 times per week, for a total of 30-45 minutes. If you extend the workouts past the 15 minute threshold or more than 3 times per week, there's a risk of burnout or over-training, especially with younger players. How do I access the material? Do I need to wait for DVDs in the mail? The entire package is presented online. So there's no endless days waiting for your material to arrive in the mail. And no shipping and handling costs. As soon as you sign up, we'll direct you into our members area. You can stream the videos over your Internet connection, watch them on your iPhone, iPad or other mobile device, or download them to your computer to watch any time! Hurry... Get Homework Hitting Now!